Haute Couture is the best place and time for a designer to prove what he or she is really capable of. And this time Karl Lagerfield showed it in the most classic, simple and yet jaw-dropping way. I think you will agree with me that the runway couldn't scream Chanel any louder. Mirrored walls and floors, thousands of reflections brings us back to where it all started - the iconic Coco Chanel's atelier stairs. Karl managed to give us all a fresh new collection, keeping it at it's classics - from the design of a runway, to head to toe looks. The show started with perfectly tailored Chanel suits, spiced up with a feminine hat and belt combination. What surprised me the most, is that one of the models dressed in one of these suits, was actually a lithuanian. It feels so surreal that a woman from my country had a chance to walk in this kind of show. As it went on, sparkles and sequins got their time to shine (literally). Flattering silhouettes of silver dresses showed off models bodies in a very delicate way: deeper necklines balanced perfectly with the ankle lenght designs. Later on, feathers dominated their way to the grand finale. 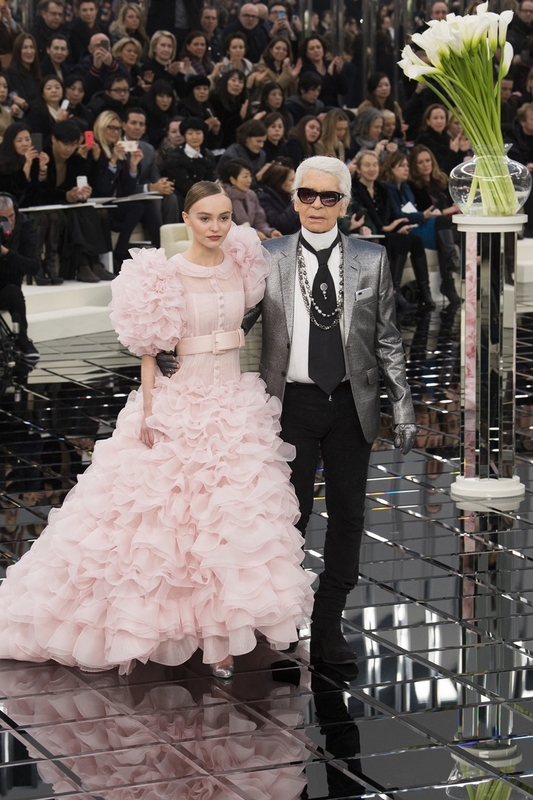 I was pleasingly surprised to see Lily-Rose Depp, the face of Chanel, walking in the most beautiful light pink wedding dress. The ending couldn't be more beautiful. All in all, this collection got me masmerized. Karl's hard work for this Haute Couture collection was clearly reflected in the walls of this runway, just the same as Coco's once did on hers. wow everything is so gorgeous! Ah, i literally swooned over everything!